Simple sharing on any screen. Don’t let technology slow you down. 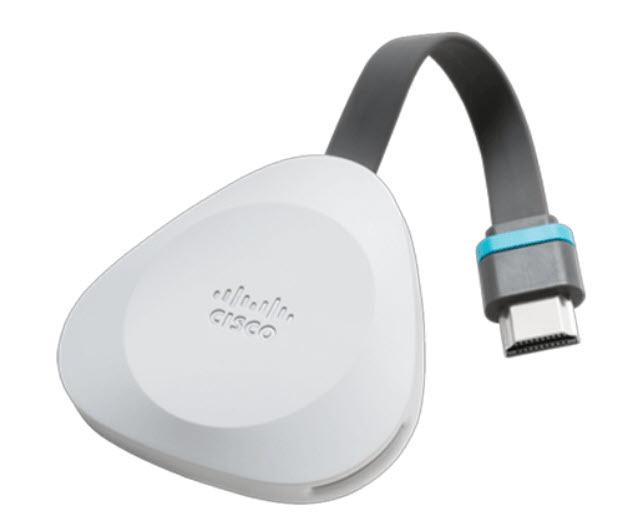 The Cisco Webex Share is a palm-sized, affordable device that allows you to quickly and easily share content to any display without using cables or dongles. Wirelessly share your entire screen or a specific app with one click from your Webex Meetings or Webex Teams app. When plugged into any display, the Webex Share device greets you, shows you the calendar schedule for the day, and invites you to share content to the screen. With the Webex Share you no longer need to use cables or dongles or adjust audio/video settings before sharing content to a screen. When paired to the device with your Webex Meetings or Webex Teams app, you can share content wirelessly with a single click. The Webex Share is designed with your workflow in mind. You have the option to share a specific app only, so you can multitask without interruptions to your work. Of course, you can also opt to share your whole screen. Connect your whole team without compromise and boost productivity. The Webex Share allows any participant to share content, regardless of whether the team member is physically present at the meeting or joining from a remote location. IT organizations love the Webex Share because it offers easy setup, single-pane-of-glass management, and analytics. By tracking the usage in huddle spaces and meeting rooms, you can easily scale your infrastructure and plan your future resources.